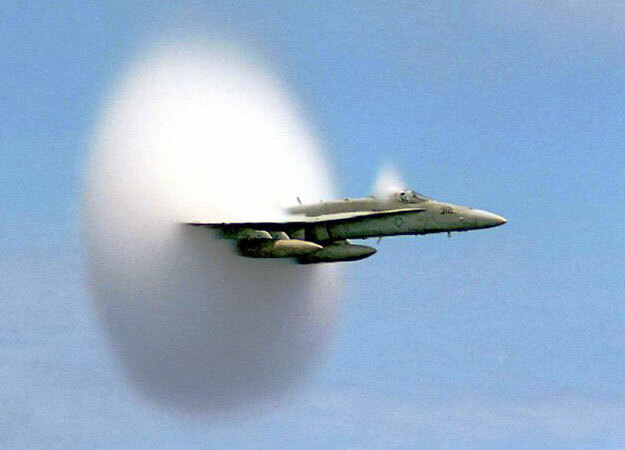 Want to see a real picture showing sonic boom? 3. Click the mouse button within the window to suspend the animation, click it again to continue. The mouse position(related to initial poition) will be shown. Left click the mouse button and drag it to show the displacememt. Right click the mouse button and drag the mouse to show the angle. 4. Click at the center of the red ruler to drag it. Click at either end and drag the mouse to change its length. 5. Shock wave is formed if the point source moving faster than the wave speed. If you change the source speed larger than wave speed, you will see something similar to the following picture (from http://antwrp.gsfc.nasa.gov/apod/image/0102/sonicboomplane_navy.jpg). and I bought some 1st year university text book to study Physics as hobby. that I discovered your site I understand a lot !!. but with just few minute of virtual experiment with 'Doppler effect and shock wave' it became clear to me !! Really thankyou very much for your site. I regard you as my teacher. With respect and best rgds. 1) I would not allow the user to set a negative wavelength. 2) If negative source speed is chosen, your source runs off the edge of the window. 3) Negative wave speed is a bit awkward, since your source is actually a sink. and I was trying to describe how the sound waves come together to make it happen. and we just wanted to let you know that your work was appreciated. Thank you! That was fast! delta x, delta y; rather than only distance from source. angles of incidence, the incident beam became solid red! that but I forgot to write it. hurry until wednesday so I may have made a mistake. end of the term. Perhaps it is the same for you. applets and they look good! >> dense media become gray. >> that but I forgot to write it. >Try the attached java applet and let me know if this is what you want. >Pick p-wave or s-wave from the top left selection. >> hurry until wednesday so I may have made a mistake. > not necessary equal to period of the wave). >with the same period of the wave. Try it and let me know what you think. >I will try to add sound effect at the next release. >I will have to do other stuff first. We do end our sentences with . though. possible? Did you do some code cleaning when you added features? Were you able to open the Qbasic files? Is there a complete list of applets like this one? We are searching for an applet library, suitable for unmonitored student browsing. Is there one here at ntnu? There are hundreds of physics related java applets in this forum. You are welcomed to check it out. Suggestions for the applets are highly appreciated! About Astronomy picture of the day I can't imagine the horse power and total air scoop that the airplaine blows to reach the speed of "faster than the seconds". Really GREAT! When I created java applets for physics topics, I will create a Chinese version first. Then, I will add a English version when I have free time. So there are more applets in our Chinese forum , and there are many other multi-media for physics teaching,too. But I do not have time to translate all of then into English. Because I do all of this with my free time(after work). What I can promise is: If you need any simulation for physics teaching/learning and you can not find a similar one from the net, you can post it at Request for physics Simulations . I think it is due to your browser did not support java. You can download Java Runtime Environment (JRE) from sun's web site and install it on your computer. The photo of plane crossing the sound limit is real? If yes then, the cone is made of what? is it made of air? We would not be able to see air directly with our eye. But we can see a cloud of water drop if it is dense enough. What you need to do is click "get files for offline use" button in the first message (select email to you or download directly). It is just one click away! and I bought some 1st year university argument book to abstraction Physics as hobby. that I apparent your website I accept a lot !!. but with just few minute of basic agreement with 'Doppler aftereffect and shock wave' it became bright to me !! Really thankyou actual abundant for your site. There are so many java tool around this site. Very interesting forum. Can you explain to me how to add this great visualization in my site? Download the applet file (click get files for offline use)and upload it to your web site. You can change values in the above tags to translate it to your own format (different language translation) and the string in the applet will be changed to supplied value. And publish in site without any probelm is java.class? Can you please explain how i do it because you design applets by jdk wonderful applets. 1. If you know how to read the html source and find out the applet tag. Just change the value for parameter within applets tag should work. 2. For those who are not familar with html code. I already added an interface, you will find a new page shows up when you click download for offline use button. You will find interface for you to translate strings used by applets and html content. You can do the translation online. and the result will be sent to your email account. Just unzip the file and you will receive translated content. You can upload the unziped files to your server and it should work fine. Thanks prof so much for your explain. i learned a lot. Very nice tools and visuals. thumbs up!